Situated just a few steps away from Psarou Beach! Spend your holiday gazing at the crystalline waters of Psarou Beach and the endless horizon of the Aegean Sea in this luxurious waterfront bungalow that can accommodate up to 3 persons. 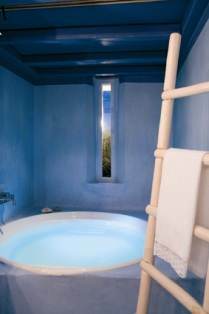 Inspired by the colors of the Aegean, the bungalow’s decor embraces a blue color palette, which is set off by the sparkling white color that is very much the traditional Cycladic architecture. 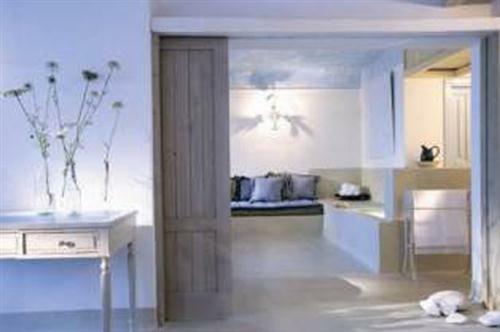 Styled with comfortable, romantic furnishings, the bungalow induces a cool, breezy atmosphere that is sure to relax you. The bungalow offers one bedroom and one bathroom. The bedroom features fluffy, comfortable beds draped in voile. Along with the plethora of fluffy pillows, it is ideal for leisurely lounging the afternoon away. A third person may sleep on the sofa bed in the living area. The modern bathroom features top-of-the-line fixtures and a recessed, polished stone shower. The rest of the bungalow features an open-layout, with a spacious and comfortable living area. Everything has been designed with luxury and elegance in mind: from the hand-sculpted light fixtures, to the billowing clouds created in stucco on the ceiling, you will be amazed at some of the details that make this bungalow stand out. Kitchen amenities are not available, however the resort complex offers fine dining options. The full resort offers the ultimate in luxury: from the modern & stylish white lobby, the indoor fresh-water pool (which opens up onto the rocky coastline), and the pool bar; to the fitness center, sauna and steam bath, you will always find something relaxing and fun to occupy your time. The resort also offers a library, TV & video room, card room, billiard room, as well as a health club offering anything from reflex massage, aromatherapy, face care, and Reiki or Shiatsu massage. Other resort amenities include: 24-hour room service, business center, dry-cleaning and laundry, cabaret shows, Greek language and dance lessons, children’s club, children’s pool, and baby sitting services. You will also find two gourmet restaurants, a lounge/snack bar and a daily breakfast buffet. 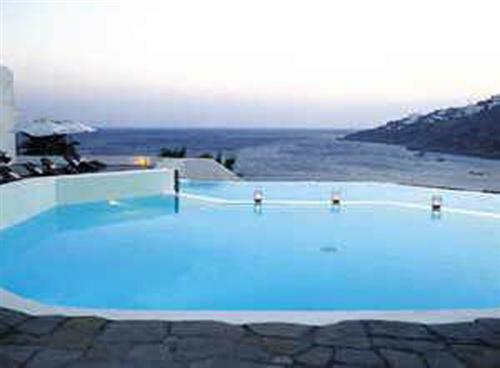 For a fabulous, sun-soaked vacation, Mykonos is the perfect location as it is one of the most cosmopolitan and fun islands of the Mediterranean - if not of the whole world! 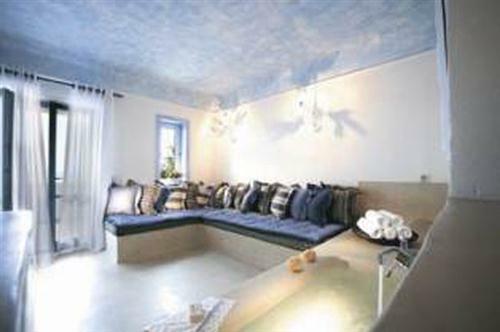 Attracting a large number of well-known artists, politicians and celebrities from all over the world, Mykonos is the epicenter of sea, sun and fun in all of Greece. Travel to the island’s main town, Hora, and spend some time exploring the narrow, cobble-painted streets enveloped by the famous Cycladic white washed homes and shops, which are boldly accented with brightly colored wooden doors and windows. The streets, which were designed to confuse pirates in the 16th century, now offer a lovely walk through fashionable boutiques, taverns, and small churches and chapels. Everywhere you turn you can find a promenade to enjoy Mykonos and its never-ending lively atmosphere. Mykonos has some of the most beautiful sandy beaches in all of the Cyclades that can accommodate your tastes. There are busy beaches, which have the vibe of a daytime club, and there are secluded beaches where you can get away from the crowds. 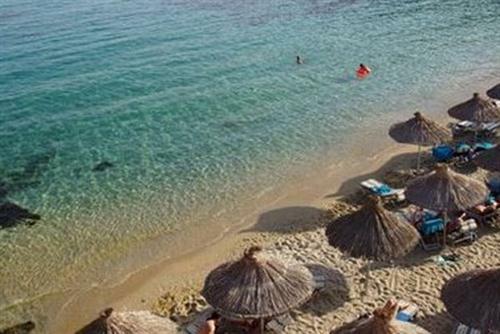 Elia, Panormos, Agios Stefanos, Psarou, Kalo Livadi, Paradise and Ornos are the most popular beaches on the island. 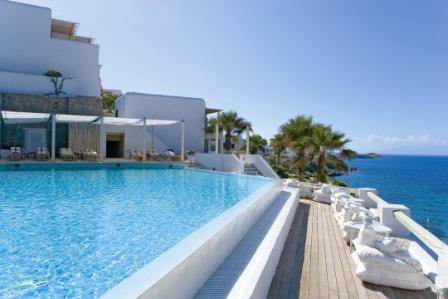 The scenic Psarou Beach is one of the top cosmopolitan spots on Mykonos island. Situated only 5 km from Mykonos Town, Psarou Beach is known for the sheltered geography, creating a cove in which you can spend all day frolicking in the sparkling clear-blue waters, golden sand, and first-rate facilities. On Psarou Beach you will find a diving school and a popular beach bar and restaurant where visitors have fun alongside the many VIPs that visit.